NEW YORK, NY--(Marketwired - Dec 17, 2015) - Adorama, one of the world's largest photography, video, audio, imaging and electronics retailers, is collaborating with the New York City Screenwriters Collective (NYCSC) to host a live podcast event celebrating Star Wars culture at the Adorama superstore in Manhattan on Tuesday December 22nd from 6pm to 9pm. The NYCSC will analyze the script of the highly anticipated film, "Star Wars: The Force Awakens," assessing whether or not the latest Star Wars film lives up to the mythology that the franchise has built over generations. Adorama will offer a start-to-finish immersion into the Star Wars world. With all six of the Star Wars films screening all day, attendees are invited to relive every moment of this epic saga. In the evening, a photography setup at the front of the store will place attendees in the Star Wars universe. Attendees are invited to arrive in costume or to use the masks, lightsabers and other props on hand for the full experience. Become a Jedi by enlisting in Jedi Academy on the Steam video gaming platform in Adorama's Apple products section. Finally, take home the action of the entire Star Wars universe by entering a raffle to win a TV and boxed set of the movies. For more Star Wars fun, be sure to head on over to the Adorama Learning Center. Read all about Pawel Kadsyz's 365 Days of Darth Vader project on his website, tookapic, where he portrays the evil lord emperor as "just a regular guy. Then, catch up on some cinematography tricks with May the Forced Perspective Be with You: The Video Show Ep. 1. In the first episode of the just-launched online series, the team explains the technique of forced perspective, using an X-Wing Fighter in Central Park to demonstrate. For more information on the event, please visit www.adorama.com. 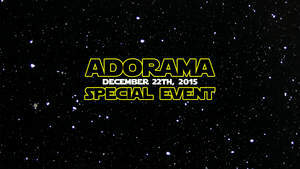 SPECIAL EVENT: Star Wars Night with NYCSC, Giveaways, Games and More at Adorama!